Put an end to vest and wetsuit chafing while keeping your skin protected from the sun's harmful rays. Put an end to vest and wetsuit chafing while keeping your skin protected from the sun's harmful rays. 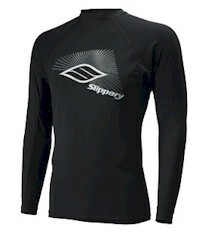 Our rashguards feature a high performance, form-fitting Lycra construction, with that trend-setting style you've come to expect from Slippery.